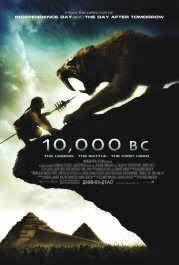 The Moviesite - 10,000 B.C. Set, as per the title, 12 000 years ago, this is the tale of two young lovers, who cannot marry due to clan differences. Things pick up when marauding raiders arrive and whisk the woman off, leaving our brave Romeo and some companions the task of tracking them down and rescuing his one true love.